Do you love football? Do you want to pass on your love for the sport to the next generation? If the answer is yes, then coaching might be the perfect fit for you! 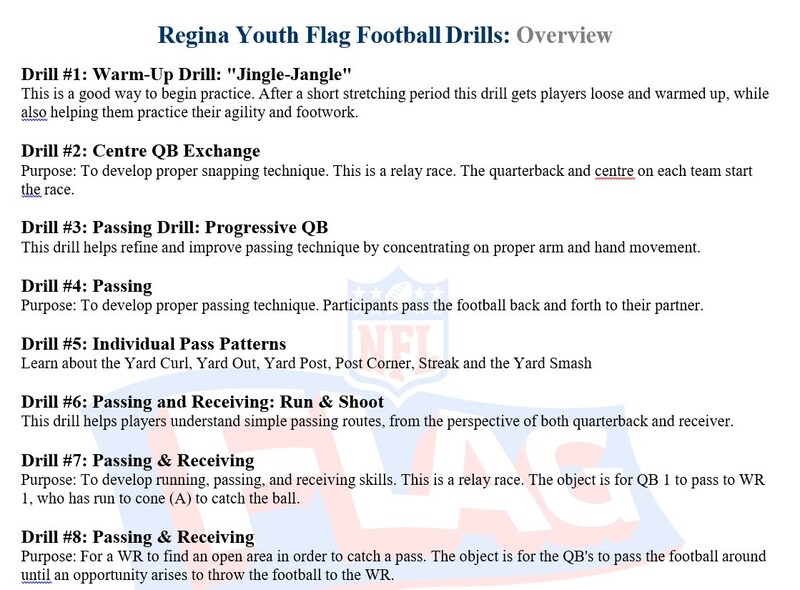 Coaching in the Regina Youth Flag Football League is exciting, fulfilling, and gives you an opportunity to teach skills to a new generation of players. Whether you’ve played at a high level or never at all, we believe that anyone can be a successful coach if they are dedicated and passionate about becoming a good coach!! Our leagues would not be the same without the amazing volunteers that choose to coach year after year. We can’t thank you enough! You’ll find an assortment of playbooks, drills, rules, and tips below to help you be the best coach you can be! We value our coaches above all else, because they are the ones that decide what kind of experience the athletes will have playing the game. For us, we determine our success by how many of our players return the next season. The more players we have return shows us they had a great time the previous year and it’s because of YOU, our coaches, who make that experience happen. 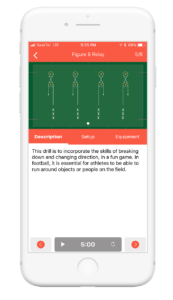 Need to be able to work with kids ages 5 – 17 and teach them fundamentals of football. Be reliable and able to volunteer for at least 1 day of practice, and 1 game each week. Must be enthusiastic, patient, and persistent. Communicate efficiently and positively with league officials and PARENTS. a. Form a single line. b. The player (lets call him Player A) in the front of the line puts his left hand behind his back, rendering it useless. c. One by one, instruct the remaining players to jog past Player A’s right side with their hands risen. d. Player A must focus on pulling each player’s flag as they jog by. 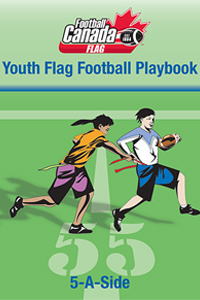 e. Upon the final flag being drawn from the right side, have Player A turn around, switch hands, and pull the flags off the remaining players as they jog by his left side. 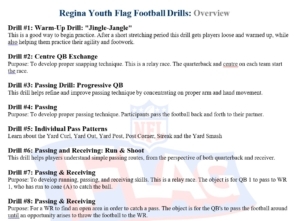 This drill, albeit somewhat basic, greatly increases hand-eye coordination and overall flag pulling ability because of its repetitive nature. Shotgun Formation: As a general rule, always have the QB step back a minimum of 5 yards (IMPORTANT: Never under center). Practice snaps at this length during practices and before games. This gives your QB ample time to read the defense and use better judgment when making throws. It may take a few weeks to master the longer snap, but roughly by week five you’ll have a much improved and dangerous team. a. Cover 1. (One safety deep, remaining defenders stay close to the ball. Used mainly on first down and short yardage situations when you think the offense is running a quick pass or running the ball). b. Cover 2. (Two safeties deep. A solid defense to call when the offense needs 10-15 yards for a first down). c. Cover 3. (Three safeties deep. Used when you believe the offense is throwing long). d. Cover 4. (Four safeties across the goal line. Used mainly in fourth and long or “Hail Mary” situations). Never Show Your Coverage: Constantly changing your defensive coverage schemes can confuse the opposing quarterback and keep him guessing. Disguise your coverage before the snap by having all defenders form a single even line with your rusher (who is seven yards from the ball). At the snap of the ball, the players move to the chosen formation. 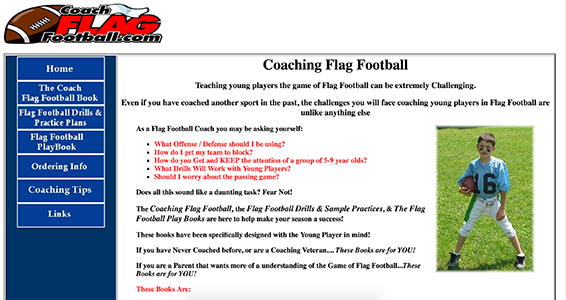 7 Yard Cushion: The most successful teams understand that the name of the game is flag pulling. Your quickness as a defender means nothing if you play too tight and get beat on a pump-and-go. Play it safe and line up at least seven yards off the ball. 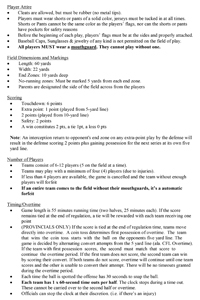 Most leagues start at the 5-yard line, and need to get to midfield for a first down. That’s 18 yards. Put the odds in your favor and sacrifice a five yard pass here or there as long as you’re able to pull the flag and not get beat. Improvements: Don’t expect miracles overnight, there will most likely be at least a couple weeks grace period until most of these skills are utilized to their highest potential. The younger the kids are, the more difficult it will be for them to process information and employ them in game situations. Be patient and stick to the basics. Keep Plays Simple: There is no need to have difficult plays. Start off with only four plays. Try to add one new play per week. Favorite Play: Great plays happen because of great execution. For example, your outside receiver does a 5 yard In, and your inside receiver does a 4 yard Out (the Cross). After this play is successful three times, attempt the “Scissor play.” This means the outside receiver does a 10 yard Post, and the inside receiver does an Out and Up. This play is money if it’s set up correctly, and you sell it by making the defense believe you’re running the Cross pattern again. Love: This isn’t the NFL; the kids need love and attention. Give them love and they will perform. Help your players be good sports. After a game, shake hands or high-five the other team. Applaud good play by both sides. Treat officials with respect. While imitating you, your team won’t even recognize the good lesson they’re learning. We thank you for your volunteer service. NFL FLAG couldn’t happen without you. Have a blast with these kids. This season may become a lifetime memory for both you and all your team. Have fun! A coach should be enthusiastic without being intimidating. They should be sensitive to the children’s feelings and genuinely enjoy spending time with them. A coach should be dedicated to serving children and understand that football provides physical and emotional growth for its participants. Remember, NFL FLAG is for the children. A coach needs to realize that they are a teacher, not a drill sergeant. They should help children learn and work to improve their skills. Personal gains are never a consideration. The job does not depend on winning. The best interest of the child transforms into the best interests of the game. The safety and welfare of the children never can be compromised. A coach will consider these factors above all others. Care more about the players as people than as athletes. The Regina Youth Flag Football program is a means to an end, not an end in itself. A coach should encourage players to dream and set lofty goals. It is important to remain positive and refrain from discouraging remarks. Negative comments are remembered far more often than positive affirmations. Remember that the rules of the game are designed to protect the participants, as well as to set a standard for competition. Never circumvent or take advantage of the rules by teaching deliberate misconduct. A coach who puts his or her opponents’ team at risk should not be involved with children. A coach can measure success by the respect he gets from his or her players, regardless of victories or defeats. Children who mature socially and physically while participating in sports are the best indication of good coaching.